His latest, Game Change, sprang from his long-standing concern about the effect of concussion on hockey players. The book focuses on the tale of Steve Montador, a veteran of twelve NHL seasons who died at age thirty-five in 2015 (and whose family is now suing the NHL, claiming the league failed to keep him “reasonably safe” during his career). Dryden’s vivid and compelling portrait of Montador’s life draws on extensive interviews with family members, friends, and teammates—and on Montador’s journal, which chronicles his struggles with the effects of injuries, especially a series of concussions, the first of which he suffered when he was just twelve. Woven into Dryden’s account of Montador’s journey from Canadian youth leagues to the NHL are two other narratives. One traces the history of hockey, from its origin at Montreal’s McGill University on March 3, 1875—a historic contest played on “clunky” skates, with no player substitutions or protective equipment—to the rugged and fast-paced game of today. The other recounts the evolving scientific research on brain injuries suffered by athletes in contact sports, focusing on the Toronto neuropathologist who examined Montador’s brain after his death and determined that he suffered from chronic traumatic encephalopathy (CTE), a degenerative disease often found in athletes who have suffered repeated head trauma. Dryden selected Montador as his subject because he was neither a star nor a “goon”—a marginal player known more for his punching than his skating. A defenseman affectionately known as “Monty” to his friends, Montador was characterized early on by his coaches as a “good, tough, hard-trying player,” Dryden writes. Like many of his peers, he wanted to be seen as stalwart and unafraid to stand up for his teammates, ready to hand out hard hits and receive them in return. Dryden notes repeatedly in the book that hockey has always involved “a compromise between performance and safety”—but, he writes, that compromise “has gone out of whack” in recent years, with too many players suffering concussions that have limited and eventually ended their careers, and even their lives. As Dryden explains—speaking with CAM by phone this winter—when he entered the game “there was much less forceful contact. You weren’t moving as fast and the players weren’t as big.” Changes in playing style since then have put the emphasis on speed, so collisions are more violent, making concussions more common. And then there are the head injuries caused by fighting. While officially against the rules, it has long been tolerated in the NHL; players are sometimes allowed to engage in fistfights for several minutes before being separated by officials and sent to the penalty box. 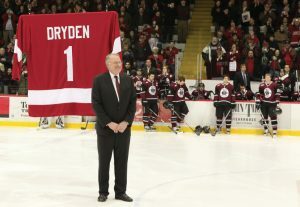 Dryden has spoken out against hockey fights for years—“extremely unsuccessfully,” he says—and he firmly believes they should be eliminated from hockey at all levels. In an excerpt from Game Change, Ken Dryden ’69 describes Blackhawks defenseman Steve Montador’s desperate determination to stay in the NHL, even as his health declined. It never seemed it would happen this way. Steve’s return to play was always a matter of time—time to allow things to settle, time to let the brain heal. A different doctor, a new treatment, a different understanding and approach to concussions, and to paraphrase what Steve had written in his journal, “Something’s gonna happen to magically make me better.” He had always gotten better before. Athletes get better. You feel, you deal, it passes, you get on with it. That’s how it had been with his back, his knee, his neck. That’s how it had been with his head. Headaches, dizziness, fatigue, sensitivity to light—symptoms that felt like they were going to last forever always went away. No scars left behind, nothing he could see in the mirror, nothing anyone else could see even on MRIs, no indications that anything had happened. It was only when he was asked by doctors about his medical history that he even remembered all those other hits to his head, that they might have been something. The time in minor peewee, that other time in junior. Those times in Calgary when he was trying to make the team, when he did a face plant on the ice and cut up his nose and cheek, when he got knocked silly by an elbow, when he got sucker-punched in a bar. The time in Florida when he ran into an opponent’s helmet with his face and broke his nose again. Then, in Buffalo, another elbow, a stick, more cuts, another break to his nose. In every instance the injury he thought he received was a break or a cut, not dizziness or headaches. It was the same earlier in the season when he slid into the boards with his face and fractured his zygomatic arch and temporarily lost his hearing. He’d had a brief loss of consciousness; but isn’t that just what happens when you break your cheekbone? If he had a banged-up shoulder and a headache, which injury was he going to focus on? Players get hurt game by game; all his big head-hits, until that season, had happened months and years apart. He’d gotten better in between. He was always fine. He had a game to play. Athletes have their own kind of relationship with pain. They play because they are so absorbed in playing that they don’t notice injuries when they happen. The soldier who is shot keeps on going because the imperative to go on is so much more important than the imperative to fall. The explanation for such a miraculous act is purpose more than courage. So players play. And players expect other players to play. Someone goes down in a hockey game and is helped off the ice. “He’ll be back,” the announcer says. “He’s a hockey player.” And when a hockey player does come back, most often he is fine. Time heals. As a player, you learn quickly: Where do you want to spend your healing time? At home, moping around, feeling the pain, having nothing to do to distract you from it? Or on the ice, with your buddies, who admire you just a little more because you are there, doing what you love and doing it for the team? Steve played for a month between January 8 and February 7 with concussion symptoms that kept recurring. Four times. Four separate hits. January 8, January 18, February 3, February 7. Why? Because he didn’t feel that bad. Because he was able to persuade himself that he didn’t feel that bad. Because he had played other times with a wonky shoulder, so why not a wonky head? Because he was tough and everyone knew he was tough, and he liked that he was tough. Because as lousy as he felt during those other twenty-one and a half hours of a game day, for the two and a half hours he played, he didn’t feel lousy. He felt the game. And for those games between January 21 and February 7 he especially played because the Blackhawks had lost five in a row and his teammates needed him. Because he needed to prove something to them, to himself, to the Blackhawks general manager, who had signed him. Because not to play was unthinkable. When he was a kid, he didn’t know anything about this long-term injury stuff, or even think about it. Why would he? He just played. Now he knew there might be some effects, but he didn’t really know—he had no idea—what those effects might be, no matter how much the experts told him and what he said back to them. I know, he’d say; I understand. But he didn’t. How could he? He’d had no idea he would feel like this. None. He’d had no idea this might go on for weeks. For months. He’d had no idea, he still had no idea. This might go on and on and never stop. This might be his life. This might be him. When he was younger, he knew: I have to do everything in my power to make this life happen. Now at thirty-two, he knew: I have it, and I must not, I will not give it up. Excerpted from Game Change by Ken Dryden. Copyright © 2017 by Ken Dryden. Published by Signal/McClelland & Stewart, a division of Penguin Random House Canada Limited. Reproduced by arrangement with the Publisher. All rights reserved.